Chances are you've never heard of Irish Tea Brack. To be honest, neither had I until I began researching Irish bread recipes for one to make for this week's pre-St. Patrick's Day blog. I had planned for weeks to make a traditional Irish soda bread but as the time approached all I could think of was how typical, how predictable and most of all how BORING! Hence my search for something unusual, at least to me. Along came Irish Tea Brack. No, that's not a misspelling of Tea Break, although this divinely dense and fruity bread would be perfection with a cuppa (or even coffee)! 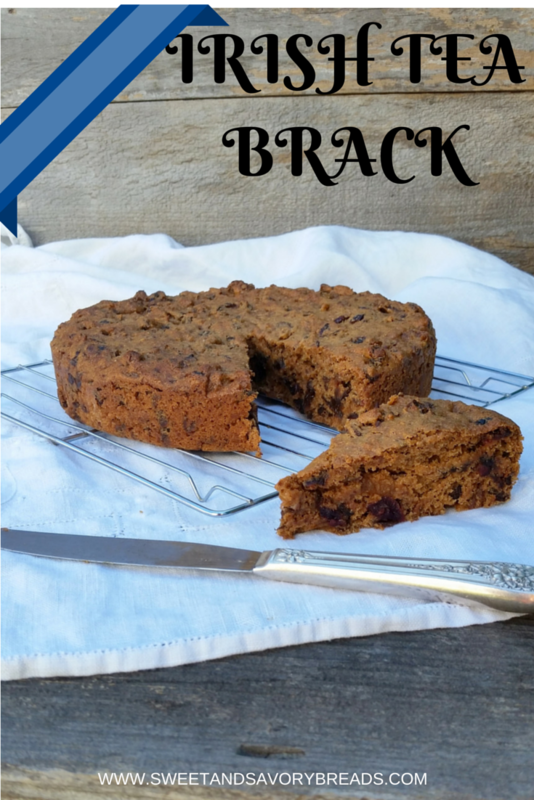 “Brack” is an Anglicized verion of the Irish word “Breac” which means “speckled”. It's no small wonder that another name for Irish Tea Brack is Irish Freckle Bread! Irish Tea Brack is leavened with baking powder rather than yeast qualifying it as a quick bread. The yeasted version is called Barm Brack. Raisins, snipped prunes and dates are jam-packed into this round loaf along with plenty of dried cranberries. Originally calling for currants, I was forced to make the substitution as a local supply of this fruit was simply not to be had. The dried fruits are soaked in hot tea, plumping and imbuing each morsel with the unique flavor of Earl Grey hence the “tea” portion of the name. Whiskey can be used as part of the tea liquid but for my version has been left out. Feel free to add a splash or two (or more) but make sure you come back and tell us how it tasted! I'll save that version for another time. Maybe after Amazon delivers my currants! 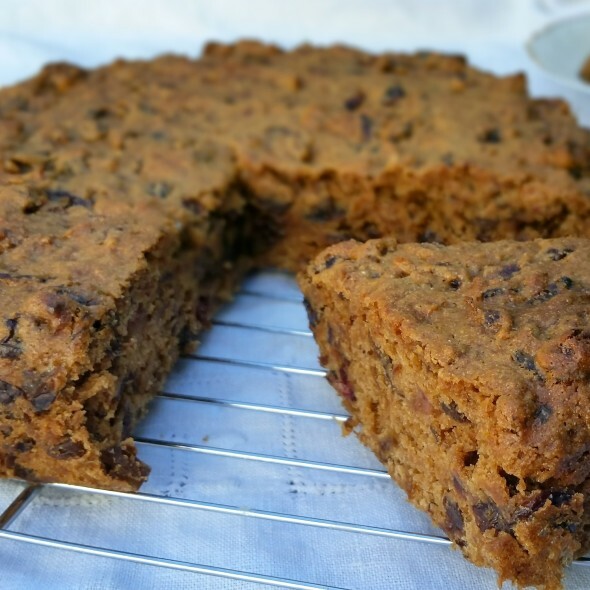 A super dense fruit bread packed with raisins, cranberries, prunes and dates. 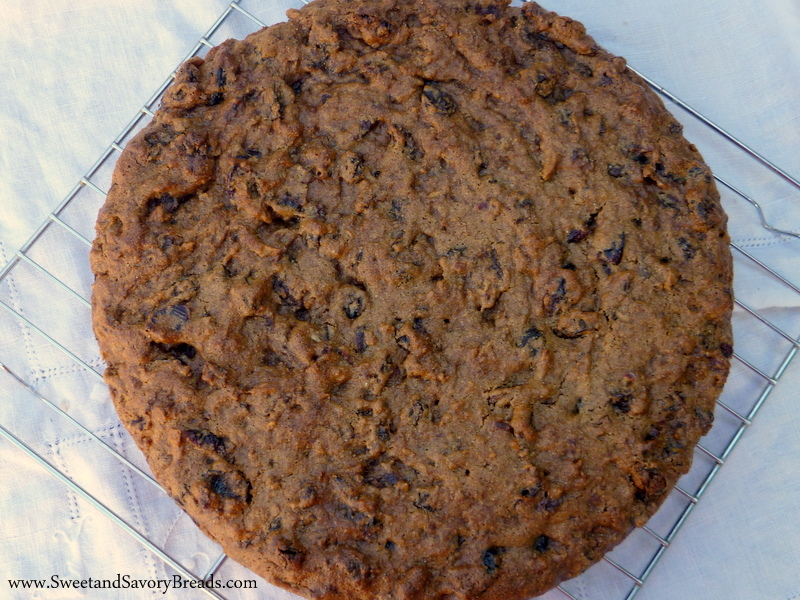 Irish Tea Brack is an Irish fruit cake that melds the taste of tea with fruit to make a bread worthy of any St. Patty's Day meal. In a medium sized bowl place all the fruits and cover with the hot tea. Set aside for 1 hour to plump. Preheat the oven to 325 degrees F. Spray the bottom and sides of a 9 inch round cake pan with vegetable cooking spray and line the bottom with parchment paper. An 8 inch pan may be used if the sides are at least 2 inches high. Set aside. In another medium sized bowl stir together the sugar, flour, baking powder and salt. Add the fruit mixture and any liquid that may be left in the bowl. Stir until all the flour is incorporated. The batter will be stiff. Stir in the egg until completely mixed then spread evenly into the prepared pan. Bake in preheated oven for 60-70 minutes or until a toothpick inserted comes out clean. Remove and cool for 10 minutes in the pan. Run a knife around the edges to loosen and turn out onto a wire rack to completely cool. A Tablespoon or two of whiskey may be used as part of the soaking liquid. Try using different teas to vary the flavor. 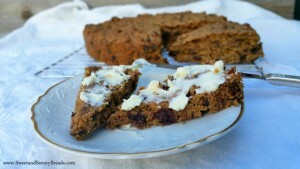 Irish Tea Brack is great warm but keeps well for several days tightly wrapped. This recipe was adapted from King Arthur Flour's Tea Brack. Posted in Breakfast Breads, Quickbreads, Sweet Loaves for GiftingTagged bread, breakfast, cranberries, dates, eggs, prunes, quick bread, raisins, sweet, whole wheatBookmark the permalink.